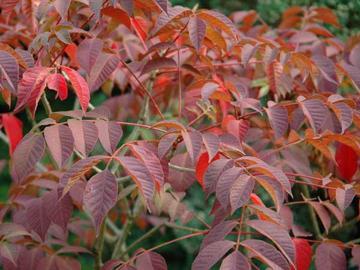 Small deciduous tree with large finely divided pinnate leaves, coppery-pink when young. Very good orange and red autumn colour. Dioecious, needing separate male and female plants to produce fertile seed. Insignificant yellow-green flowers. Bristly yellow fruits in drooping clusters on female trees.